The 616 Carry Comp II Open Double Magazine Pouch from Aker is sleek and dependable carrier with a classically rugged look. Perfect for use in the field, on the range or simply wearing around the office, the pouch features a premium leather construction along with a keen attention detail. Precision molded mag sleeves hold their shape through extended use and extreme weather, ensuring that additional ammunition stays secure no matter where the day leads. An open top design eliminates all unnecessary flaps and closures to guarantee quick item retrieval at all times. Dual tension screws allow users to adjust the holster's draw resistance to provide the perfect draw. Leaving no detail of over looked, two snap-fastening belt loops allow the Comp II to be secured over-top of pant belt loops for perfect placement regardless of clothing style. Just what you need, and nothing more. Quality leather and good retention. Great magazine pouch. Secures magazines very well. 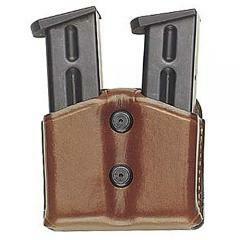 What width of belt does this mag pouch accept? Snaps onto belts up to 2.25 inches.